Jealous paranoia cannot distinguish between dreaming and waking in one of Shakespeare’s bawdiest works. There are several reasons why “The Merry Wives of Windsor” has generally been considered one of Shakespeare’s minor plays. It’s an absurd, bawdy farce set in an English country village around 1600, bereft of any epic characters, grand locales, or soaring lyrical speeches. Revolving around the rakish antics of Sir John Falstaff, the play comes across as an entertaining trifle filled with sexual puns, slapstick comedy, and a variety of ridiculous schemes, disguises, and deceptions. 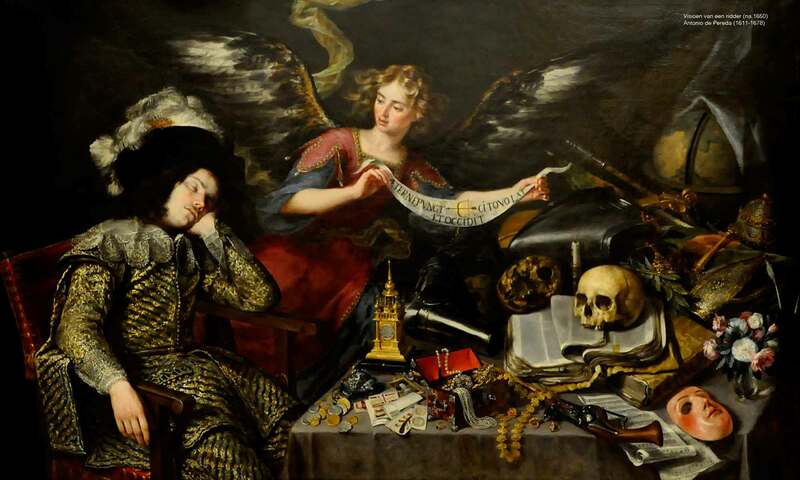 This may all be true, yet it overlooks an interesting element of darkness in The Merry Wives, an element that elicits the only references to dreaming in the play. Master Ford is the husband of one of the two wives of the title, and there is very little merriment about him. On the contrary, he stands out among the other characters for the intensity of his one driving emotion—jealousy. Master Ford also stands out for his moral rigidity and insufferable pompousness, but it’s the jealousy that really defines him and motivates his behavior. He says as much in a brief soliloquy, after meeting the other wife, Mistress Page, and hearing her talk about Falstaff. Master Ford immediately concludes that both his wife and Master Page’s wife are having romantic affairs with Falstaff, and he criticizes Master Page for failing to keep close enough watch over his faithless spouse: “Has Page any brains? Hath he any eyes? Hath he any thinking? Sure, they sleep; he hath no use of them” (III.ii.26-28). Master Ford decides that, despite other people’s doubts, he will wake everyone up by revealing the true sinfulness of these “revolted wives.” He will appear suddenly at his house and catch the lecherous Falstaff in the act: “There I shall find Falstaff. I shall be rather praised for this than mocked, for it is as positive as the earth is firm that Falstaff is there. I will go” (III.ii.42-45). In the next scene a supremely confident Master Ford brings a group of companions to his house to apprehend Falstaff. His wife, in the midst of sending out the dirty laundry, denies that Sir John is there. Master Ford contemplates the laundry basket, which is about to be sent out for “buck-washing” (a traditional means of laundering clothes by soaking and rinsing them repeatedly with lye, ash, or urine), and utters some strange lines: “Buck? I would I could wash myself of the buck! Buck, buck, buck! Ay, buck; I warrant you, buck—and of the season too, it shall appear” (III.iii.155-157). Several sexual allusions are compressed into Master Ford’s odd little speech. Unfortunately for him, while he is fixated on the multiple meanings of “buck,” the laundry basket containing the hidden Falstaff is taken out of the house. Now Master Page turns to his companions and makes a bold declaration: “Gentlemen, I have dreamed tonight. I’ll tell you my dream. Here, here, here be my keys. Ascend my chambers; search, seek, find out. I warrant we’ll unkennel the fox” (III.iii.158-162). His use of “dream” here, the first mention of the term in the play, is meant ironically. It seems unlikely that Master Ford is referencing an actual dream; rather, he’s playing with the term, to enhance the impressiveness of his ultimate victory. Master Ford is framing what he believes will be his triumphant discovery of Falstaff as a prophetic dream: last night he dreamed of something that will be revealed to his companions when they find Sir John, the implication being that Master Ford foresaw the infidelity in his dream, and now his companions will see tangible proof that his dream has come true and he was right all along. But there are at least a couple layers of deeper irony to his “dream” that Master Ford does not seem to recognize. First, his companions do not find Falstaff in the house, so his allegedly prophetic dream fails to come true as he so grandly predicted it would. Second, the certainty he feels about this dream, and about his wife’s sinfulness, is actually based on his own vain and substance-free fantasy that he assumes is as solid as the earth itself. And third, if he had not been so absorbed in his resentful musings (“buck, buck, buck!”), he might have noticed that Falstaff was in fact right in front of him; so Master Ford’s dream did come true, but he was too captivated by his jealousy to realize it. By making the self-aggrandizing claim that he had received a miraculous dream revelation of Falstaff’s illicit presence in his house, Master Ford only magnifies the humiliating mockery he feared would be the result of his efforts to unmask the sinners all around him. Again, the irony is that by forcing himself to “awake,” he is actually descending even further into his jealousy-fueled fantasy. By rejecting dreaming, he is rejecting something that could in fact provide him with accurate insight into the perception-warping effects of his violent passions and emotional insecurities. The production of “The Merry Wives of Windsor” I saw recently at the Oregon Shakespeare Festival featured the actress K.T. Vogt as Falstaff, a brilliant piece of casting that breathed new life into the old rogue and his errant codpiece. Master Ford was played by Rex Young, an OSF veteran whose evocation of fragile male pride was strong enough to drive the plot forward, but not so strong as to overwhelm the delightful antics of everyone else. The aesthetic design of the OSF production was shaped by the giddy, gaudy 80’s, with pastel clothing and bouncy music, and in Master Ford’s second soliloquy, which ends with an angry pledge to fight back against his tormentors (“I’ll be horn-mad”), the musical accompaniment is “Psycho Killer” by the Talking Heads—a perfect touch for the dramatic moment. Master Ford is indeed committing himself to the darkest of purposes, and yet he does so to the beat of an irresistibly danceable song. Perhaps “The Merry Wives” seems like a minor work because the shadow elements are limited to one character and never become so intense that they overwhelm the lighter elements of love, laughter, and play. But those darker energies are there, and are a significant part of the story. Here as elsewhere in Shakespeare, the seemingly illusory experience of dreaming provides a portal into hidden realms of emotion and desire that reflect the deepest and most honest realities of human life. Some versions of Shakespeare have “Bead” instead of “Bede.” To me, “Bede” makes more sense as a reference to the 8th c. monk Bede and his famous work of astronomy The Reckoning of Time. In Shakespeare’s time Bede was still considered an authority on lunar events and the impact of the moon on earthly life. I don’t know what “Where’s Bead?” would mean in this context (there’s no reference to a character with that name), but “Where’s Bede?” could mean something like, “Where’s our authority on the moon, because this is certainly a realm under a strong lunar influence?” It’s the kind of thing an Elizabethan might typically say upon first entering a beautiful moonlit glade at night. The rest of the passage suggests a sharp religious dichotomy: prayers and spiritual humility can protect against fairy attacks and prompt restful sleep and inspiring dreams (“raise up the organs of her fantasy”), while people who do not pray or “think on their sins” will suffer sharp pains all over their bodies during sleep. 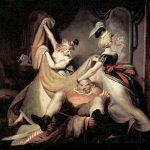 This scene has strong echoes of “A Midsummer Night’s Dream,” written a few years earlier, and of other plays in which sleep and dreaming are presented as eternal battlegrounds between competing supernatural beings fighting over our souls. This may or may not have been Shakespeare’s personal view, but it does reflect widely held beliefs among his culture and the members of his audience.